A manufactured fat product that is intended to resemble butter in taste, texture and appearance. Margarine is comprised of 80%% fat and is made from various vegetable and animals fats combined with flavor, emulsifiers, coloring agents, added vitamins and preservatives. Margarine naturally appears white or almost white. Yellow food coloring is added to most margerines available in supermarkets today. Flavors: From a barely perceptible "greasy" taste to a hyper-intense buttery flavor. Choosing: Chose margarine with lower oil and fat levels; avoid margerines containing trans fats. Procuring: The basic method of making margarine today consists, as it did in Mège-Mouriés day, of emulsifying a blend of purified vegetable oils with skimmed milk, chilling the mixture to solidify it and working it to improve the texture. Commonly used for baking. It is a major ingredient in making pie crusts, cakes, casseroles, and many desserts. Melted margarine also works well as an additive to baked potatoes and a topping on cooked green vegetables. 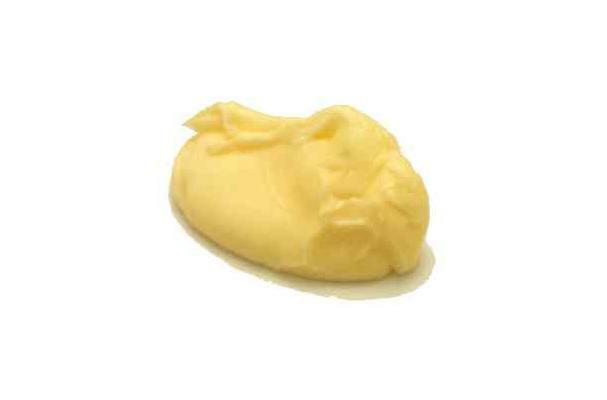 Margarine is an excellent basis for dark roux due because it will not burn as easily as butter. Margarine continuously refrigerated will last for about one month after the "sell by" date on its package. To freeze margarine, wrap tightly in heavy-duty aluminum or plastic freezer wrap, or place inside a heavy-duty freezer bag. Margarine was originally created in the late 19th century as a substitute for butter. In the United States, concern from the dairy industry led to a ban on added coloring so that it would not be confused with butter. In some states, manufacturers were required to add pink coloring in an effort to make the product appear unpalatable (although these laws were struck down by the Supreme Court in 1898). Manufacturers were required to pay a very high license fee and tax the margarine, further hindering competition with the dairy industry. "Bootleg" producers of margerine products flourished during the first half of the 20th century, and grocers sold "pellets" of coloring to consumers so they could color their own margerine. The demand for margerine grew throughout the world despite the efforts of the dairy industries to repress it. In the United States, margerine lost favor to butter during the Great Depression, but when WWII led to rationing of dairy products, margerine became a staple in American households. By the 1960's, margerine restrictions were lifted throughout the U.S. and it became a common substitute for butter. History: The discovery of margaric acid by Michel Eugene Chevreul in 1813 helped facilitate the discovery of margarine in the late 19th Century. In 1869, Emperor Louis Napoleon III of France offered a prize to anyone who could make a satisfactory substitute for butter, suitable for use by the armed forces and the lower class. In 1869 French chemist Hippolyte Mege-Mouries invented a substance called oleomargarine, the name became shortened to the trade name "margarine." His product had little success until 1871 when the patent was sold to the Dutch company Jurgens, which launched an international marketing campaign.